If you are looking for information on the HuHot Mongolian Grill franchise business opportunity, HuHot Mongolian Grill franchises or HuHot Mongolian Grill franchising, then you have come to the right place. A Hot Food Franchise Concept Is Sweeping The Nation. It's trampling old notions of full-service dining. Warming lamps and steam tables lie smashed in its wake. At HuHot Mongolian Grill, diners customize their own meals by choosing from dozens of fresh vegetables, meats, noodles and sauces. Even as you read, the empire expands. Why our brand of Mongolian Grill is your destiny. One basic product - fresh stir-fry - personalized in infinite ways. HuHot restaurants retain all the profitable simplicity of a limited-menu concept, but demand the price point of a full-service dining experience. Patrons are greeted and seated; beer, wine, appetizers, and desserts are available. Unlike the same old meat and potatoes fare, HuHot is all about healthy choices, made fresh. The meat. The seafood. The noodles. Experiment with dozens of sauces made fresh and in-house every day. Then comes the entertaining part. Hand it to the chef, who stir-fries it on our huge Mongolian grill, right before your eyes. In minutes, you sit down to a piping-hot, custom creation in an otherwise full-service restaurant. Making lunch or dinner isn't just a meal, but an experience that's truly your own, and different every time. Add beer, wine, appetizers and desserts, and you've got a complete dining adventure. The talk of the soon-to-be-conquered nation. We have caught the eye of the trade press, and that's just the beginning. Current plans call for five to 10 new locations each year, and no place is safe from the HuHot conquest. An aggressive, multi-pronged advertising and public relations effort support every expansion. "by focusing on distinctive ambiance, fresh and healthful food, good service and sound franchising strategies..."
HuHot was included in Restaurant Business Magazine's "Future 50" in 2007, 2008 and 2009. 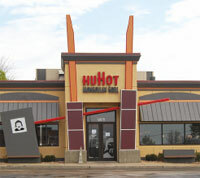 Entrepreneur Magazine ranked HuHot #386 in their Franchise 500 in 2010. "For someone considering investing in a franchise no single factor is more important than franchisee satisfaction," stated Eric Stites, President and CEO of the Franchise Business Review. "The level of current franchisee satisfaction with any franchise is a primary leading indicator of future success." How do we keep our armies advancing? HuHot Mongolian Grill franchisees receive extensive support from HuHot corporate staff. Beginning with location selection assistance, our support continues during construction and through the first month after the restaurant is open. Franchisees are required to hire their operating managers well before their location is open and send them to our headquarters for a minimum of three weeks of training. Our training crew, called the Opening Team, arrives at least one week prior to opening and stays at least one week after opening to train all of the newly hired employees and to assist with the restaurant opening. Thereafter, support is provided to franchisees through easy access to trainers, VP Operations, the marketing department, etc. Even the CEO is only a phone call away. Our website's intranet portal provides easy and immediate access to an extensive database of support and marketing materials 24/7. Opening training and support will be provided by HuHot Mongolian Grill corporate personnel. Our training team has a combined 50 years of experience.